Ruby Woo by MAC Lipstick. I got the Ruby Woo matte lipstick which I have been told, on many occasions already, that it is pretty much a classic by MAC so I am happy to have chosen it not knowing it was an actual classic at the time. I feel this is a good base to start a collection...because yes I am hooked now on MAC lipsticks. I've worn it many times already and I am totally in love with it , and if you would like to read my review Ruby Woo then click here. Also, I just found out that I won a MAC lipstick of my choice by entering a giveaway on the very cute Ellen's blog. I could not believe it and I can't wait to receive my choice: 'Craving' and I am sure you'll hear about it very soon. Top & Base Coat & Nail Hardener by BarryM. Lately I went to the Barry M Spring Launch and during that event I got the chance to have my nails done with one of the new nail polish shades and this particular nail hardener was also used on my manicure. My manicure lasted almost a week and in my experience, this is pretty good as my DIY one usually last 2 days or 3 at the most. 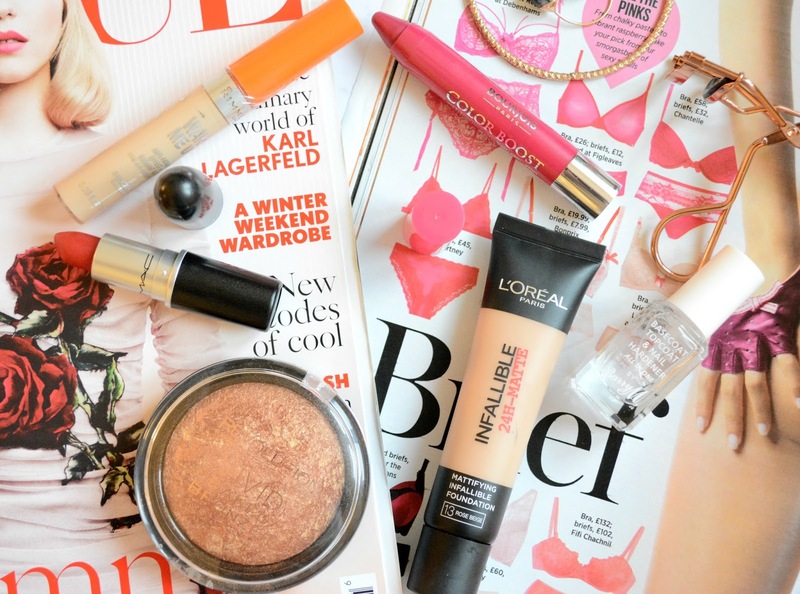 Infallible L'Oréal : This is my favourite foundation at the moment. I already had the shade 12 Natural Rose but this time, I went slightly darker and I got the shade 13 Rose Beige to add more warmth in my make up. Wake Me Up by Rimmel. Who does not own this concealer? If you are not raising your hand then you are missing out! This is the concealer that most beauty bloggers rave about and to add to the amazingness its also inexpensive. This is my second one in my all time winner shade 010 Ivory. Color Boost by Bourjois. From this collection, I already own Plum Russian and Red Sunshine which have now seen better days and are pretty much at the end of their life. As I loved them so much, I decided to try Pinking Of It which is a vibrant fuschia colour. Vivid Baked Bronzer by MakeUp Revolution. I have been craving a bronzer just like this one since last summer and when I came across this gorgeous bronzer at a very reasonable price I had to get it. I am sure you'll agree with me on this!